The Bogota Volunteer Fire Dept. held their annual Chief's Election on Saturday Night. Current Fire Chief Dan Klima named Assist Chief James Berthold of Hose Co. #2 as Fire Chief for Bogota for the year 2014. With that Battalion Mike Brophy of H&L#1 becomes the Assist Chief. While Chip Greiner of Hose Co. #3 was selected as the new Battalion Chief for next year. In his address Chief Klima thanked the Borough of finding a way to refurbish the Hook & Ladder #1 vehicle for about 1/3 of the cost of a replacement truck. He then asked if the next priority could upgrading the "turn-out" suits the Firefighter wear while on a call. Chief Klima stressed that these suits are sometime the only thing protecting the Firefighter from harm during a recuse. Chief Klima thanked his follow Firefighters for their dedication to help ensure the safety of the citizens of Bogota. He also acknowledge the effort of the four different Companies to perform as a single Department both on and off duty. With that Chief Klima talked about how it was a harder task to pick just one Company to win the Chief's Trophy this time. The winner of the Chief Trophy was Engine Co. #1 as the top company in Bogota. Also being honoured was Adam Schaefer of Engine Co. #1 as Firefighter of the Year, for his professionalism and his willingness to help other Companies when needed. Firefighter Schaefer would not just help on a call , but would also put in time with maintenance, and cleaning if other Companies needed it . 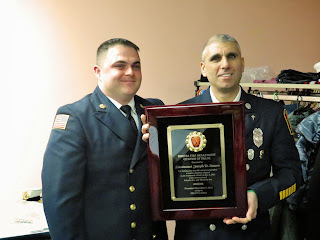 Chief Klima gave out a special unit citation to members of the Bogota & Hackensack Fire Dept for their working together to recuse the victims of a car crash on 8 July at Palisade & West End Ave. Then Lt. Joseph DiMauro was single out to receive Citation of Valor for his action during that same incident. Lt. DiMauro while off duty was near by the accident scene, and rush to assist one of the drivers who had been trapped in a vehicle at had ended on it's side. Lt. DiMauro told about when he arrived he could see the driver was trapped by her legs and was hanging loose inside the car. He proceeded to aid her until Rescue workers could safely remove her from her vehicle. Also attending the meeting were members of near-by Fire Dept. including Ridgefield Park Mayor George Fosdick who thanked the Bogota Dept. for the years of cooperation between the two Dept. The Bogota Fire Dept. along with the Rescue and First aid Squads are all volunteer organizations. For more information about volunteering please to to bogotafire.org/ or call; 201-342-1736 ext. 2007.
and Robert Dirr (H#2) as new Captains. and Ed Reiper ( H#2) as new Lieutenants. Out going Chief Dam Klima (L) presenting new Chief James Berthold his Chief Badge. New Chief James Berthold presenting Assist Chief Michael Brophy with his badge. 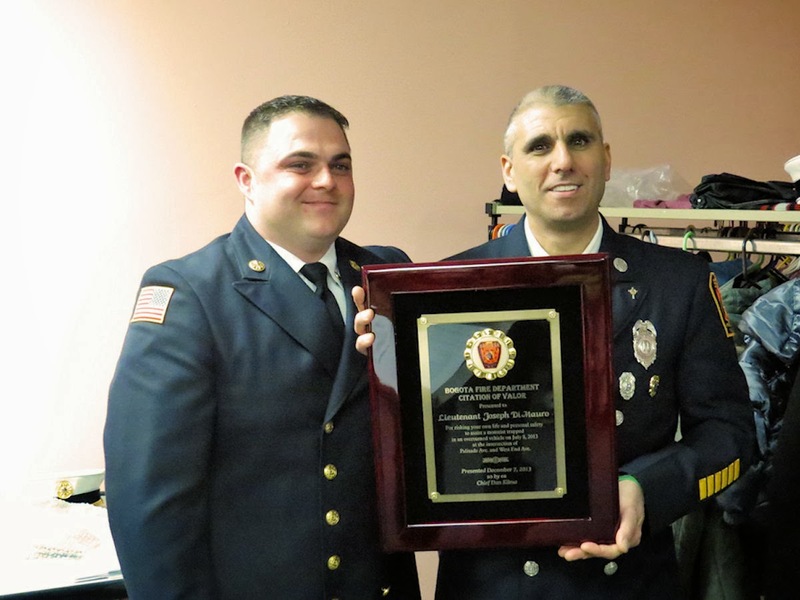 Chief Dan Klima with a plaque for his time as Chief for 2013.
a Citation of Valor for his response to an accident on 8-July.